I will be demonstrating a (relatively ) low tech method of wrinkling up fabric at the April meeting of the Contemporary Quilters’ Group of WAQA so I made this bag to show what you can do with the outcome. The fabric is an interesting 100% cotton woven in Indonesia and bought straight from the loom on a holiday. Not only is the method low tech and reasonably cheap, it is sufficient embellishment for a cotton bag. I had several nice alternative strap options and some good stones to add but really they would have been OTP. I opted for a fabric strap and nothing else. This bag is also interesting to me because I ran out of the usual product I use for interfacing, so I substituted heavyweight Fast2Fuse, ignoring the glue on both sides and just stitching it in. I was quite surprised how pleasing the results were in terms of the body of the bag. It stands up but doesn’t feel unpleasantly rigid at all. Hand woven Indonesian cotton fabric, crinkling technique for the tab, self lining plus Fast2Fuse interfacing and magnetic closures. This entry was posted in Bag, fabric crinkling, Machine quilting, patchwork. Bookmark the permalink. 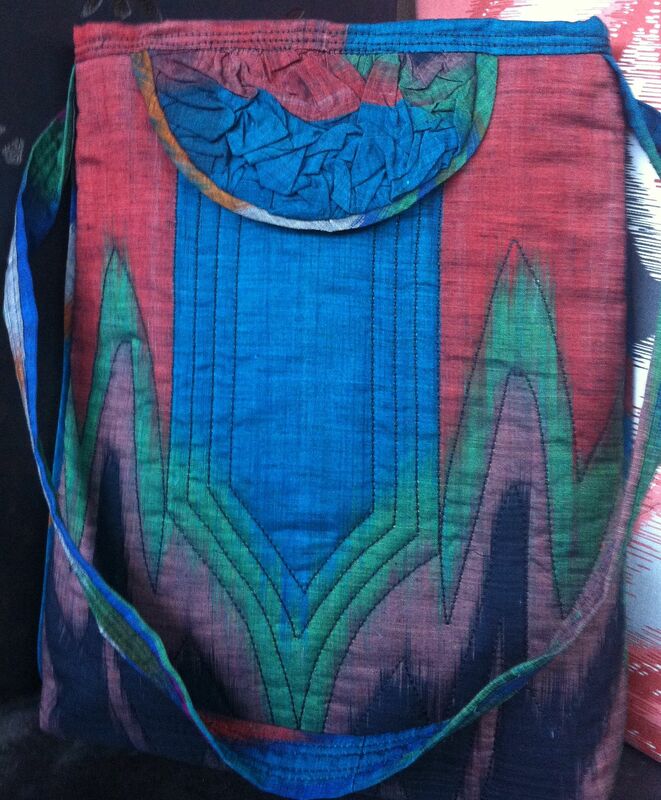 Great use of an interesting fabric – makes a nice bag & The crinkle fabric looks good too. Wow, you have been busy. I would love to see how you crinkle the fabric.